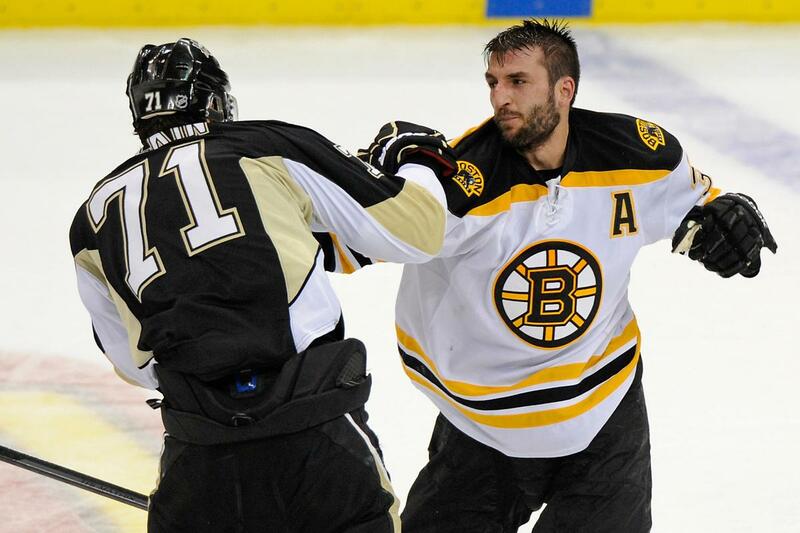 The Pittsburgh Penguins and Boston Bruins met on NBCSports' "Rivalry Night" for the second meeting between the two teams this season. Pittsburgh won the first contest 3-2 in overtime on Evgeni's game-winner. In that game, Marc-Andre Fleury recorded his 300th career win. While Boston enjoyed a sweep of Pittsburgh in the 2013 Eastern Conference Finals, the Pens have dominated the B's during the regular season, posting a ridiculous mark of 8-1-1 in the teams' last ten meetings. Boston entered the night occupying the ninth spot in the Eastern Conference, one place out of the playoffs. Despite an Oregon Trail's worth of injuries and illness (Paul Martin returned to action for the flightless birds), Pittsburgh sat tied atop the Metropolitan Division with the idle New York Islanders. Both teams traded scoring chances, with the Bruins ringing a shot from the near boards off of the post and the Penguins forcing Boston goalie Tuukka Rask to aggressively turn aside two Pittsburgh odd-man breaks. Beau Bennett would give Pittsburgh an early 1-0 lead when Evgeni Malkin, spinning behind Boston's net, found him unmarked at the post. Bennett jammed a shot under Rask to give the much maligned Bennett his second goal of the year. Crosby generated his own scoring chance when he split the defense, only to have his backhand strike Rask in the crest for a relatively easy save. On the ensuing faceoff, Boston's Kevan Miller high-sticked Bryan Rust for a Penguins' power-play. The Pens' power-play, which had been operating at just a 10% clip over the past 25 games, failed to score despite some early scoring chances. The Malkin/Spaling/Bennett line dominated play for most of the period, sustaining pressure with good high-low cycles. Later in the first stanza, Brandon Sutter made a sprawling defensive play to break up a Bruins 4-on-2, and on a subsequent trip up ice, Paul Martin took a penalty to set Boston up with the man advantage. The Bruins couldn't muster much in the way of a scoring chance on the power-play, but with just over 2 minutes left, Zdeno Chara blasted a perfect shot from the point to the upper right corner to tie the game at 1-1. The Pens outshit the Bruins 12-8 in the first period while Boston outhit Pittsburgh 15-9. After failing to score on their second power-play chance, Pittsburgh had a goal controversially waived off after Adam McQuaid pushed Zach Sill into Rask, and Craig Adams' shot eluded the Boston netminder. The Pens would go back to the power-play after Brad Marchand went off for high-sticking Robert Bortuzzo, but Pittsburgh failed to record a single shot on goal. In fact, the first half of the second period was a neutral ice affair with neither team able to generate much in the way of scoring chances or sustained offensive zone time. Later, Kris Letang took the brunt of a Boston dump-in from center ice that struck him squarely in the lower body, but Letang would be able to stay in the game. Boston would take the lead when Milan Lucic picked up his second assist of the night in finding Patrice Bergeron high in the slot via a redirected puck. Bergeron made no mistake, ripping the puck past Fleury to give Boston the 2-1 lead despite being outshot by the Penguins 12-3 to that point. Daniel Paille had back-to-back scoring chances late in the second, missing wide on a partial breakaway (courtesy of a great Milan Lucic breakout pass) and had a second opportunity from the slot deflected just high above Fleury. Crosby would miss an excellent chance from between the circles with 30 seconds left, and Reilly Smith nearly converted a 2-on-1 with only a handful of seconds left, but Fleury was able to move from his right to his left to keep the game a single goal affair. Once again, Pittsburgh dominated in shots (14-6) but entered the third period looking up at Boston on the scoreboard, 2-1. Evgeni Malkin wasted no time after the puck dropped, unleashing a bomb from the left circle that scorched past Rask to tie the game just 14 seconds into the period. Less than two minutes later, the Penguins would get their fourth chance with the man advantage with Eriksson off for holding, and once again, Boston would stimy Pittsburgh's efforts to keep the contest knotted at 2-2. Boston would counter with sustained offense, but couldn't push the puck past Fleury. New Penguin David Perron nearly converted a nifty feed from Steve Downie, but Rask squared him up from in tight. With about 12 minutes left in regulation, Malkin narrowly missed far side following one of his patented gallops around the offensive zone. The Penguins continued to enter the Boston zone with ease, blending successful dump and chases with possession carries. Rask was forced to make a few point blank saves, and Sidney Crosby rang a shot squarely off of the post but the Bruins' netminder was able to cover and hold. Regulation ended with the Penguins dominating the Bruins 37-19 in shots. Boston won the draw in overtime, but following a careless giveaway in the offensive zone, Sutter and Bennett skated back down and Sutter nearly won it by swatting a deflected puck out of the air against the post. The Bruins would then establish the cycle and whale two shots against Fleury that he easily turned aside. David Perron would earn a little Pittsburgh fan love when he dumped Chris Kelly into the Penguins' net following a Fleury hold. On the ensuing faceoff, Bergeron and the Bruins won possession and nearly won it with the puck just trickling wide of the Penguins' netminder. Seconds later, a Milan Lucic shot from the center point flew past Fleury, where after a video review, it was determined that Patrice Bergeron's stick touched the puck below the crossbar and Boston was awarded a good goal to give the Bruins the 3-2 win and the extra point.